Carpal tunnel surgery can be performed using different techniques. Traditionally, an incision was used that extended from the palm into the forearm. Currently, an incision in the palm, approximately 1 inch, can be used to perform this surgery. 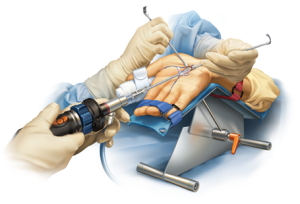 In addition, endoscopic techniques are commonly utilized by many surgeons to further reduce surgical trauma, improve visibility, and speed recovery. In certain circumstances, using an open technique instead of an endoscopic technique may be indicated. At HCON, we offer multiple techniques and try to individualize treatment for each patient. We also make efforts to try non-operative treatment options before recommending surgery when appropriate.